The legacy of this Institute has now entered its Golden Jubilee year. During next ten years on the basis of road maps received from all academic Heads, the total strength of the students in UG and PG courses shall be around 10,000. For increased strength of students, additional space of approximately 120,000 m2 shall be required. The proposed building will be only one of its kinds which will provide dedicated floors for Faculties of different trades of Engineering, Architecture, Sciences and Management will be constructed on campus to meet the present and future demands. Needless to say this building shall be an icon. The ambience of the main gate of the institute does match with the eminence of the national repute institute. Various designs are under consideration for changing the aesthetics and operation of the gate. During next ten years on the basis of road maps received from all academic Heads, the total strength of the students in UG and PG courses shall be around 10,000. For increased strength of students, additional space of approximately 120,000 m2 shall be required. The proposed building will be only one of its kinds which will provide dedicated floors for Faculties of different trades of Engineering, Architecture, Sciences and Management will be constructed on campus to meet the present and future demands. Needless to say this building shall be an icon. 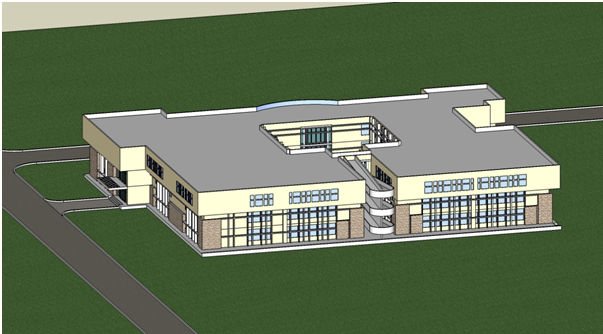 The proposed Building would accommodate all the Departments, including faculty rooms, laboratories, Computer Center, Library, administrative offices, Board rooms etc. Revised master plan is also shown to squeeze in the proposed building. 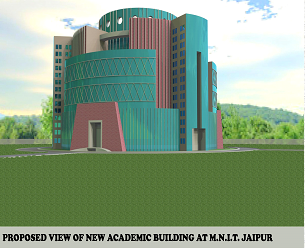 The Integrated Lecture Theatre Complex of over 50 lecture rooms to facilitate an enhanced state of class room teaching and each equipped with most modern teaching aids is in final stages of Design and development of its architectural proposals. Development of a CAD centre has been taken up. Conventional teaching of engineering graphics and machine drawing is to be replaced with computer aided design as per the needs of the society. Existing drawing hall is being converted into an air-conditioned computer centre which shall be available for regular classes in the day hours and for research work round the clock. Under ground drawing hall is to be converted into a Centre of Excellence for design. To cater the routine needs of Mechanical Engineering students as per their curriculum, workshop is essential. Many consultancy, testing and research and developmental activities by the students as well as by faculty members are taking place regularly. To cop up with the advancements in the technology, excellent fabrication facilities with state of art machines and equipments is to be created utilizing the space of existing workshop buildings. 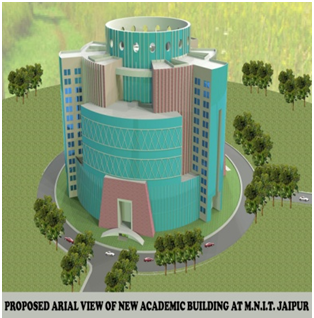 Development of State of art Computer Centre and Digital Library which is to be one of the biggest in the state of Rajasthan. It will facilitate more than 1000 workstations for the students to tease their young minds for hands on training and research. 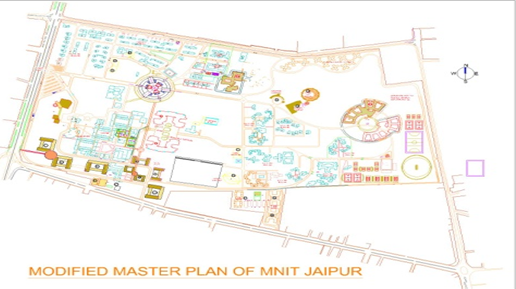 Central Computer Centre is to go for an extension of resources to cater to the need of around 5000 users comprising of students, faculty and staff personnel at centralized place housing over 1000 intelligent units. Availability of computational resources and services via a stable and widespread campus wide network shall always remain a compulsion. Achieving 24x7 resource functionality and availability is the motto of this expansion plan. The work has already begun with the addition of two floors on the existing Design Centre building having carpet area 8000 m2. At present a mini auditorium which can accommodate only 150 students is available which is too small looking into the level of events of national and international repute is organized in the institute frequently. The Institute may soon cherish their dream of having a Convention Centre on campus with the work being in progress in finalizing the concept and proposals of the same. This shall include a major auditorium of 2000 capacity together with two of 500 capacities each. The institute has gigabit network based on fibre-optic backbone available with 155 Mbps connectivity available through BSNL. The institute is going to have in near future complete wi-fi connectivity as a back up to existing wired network. The state of art IP based telephony, both wired and wireless will provide seamless voice communication throughout the campus. To interact with experts worldwide and to gain from their experiences, a high – definition video conferencing facility will also be integrated with the internet backbone. The campus will also be made complete intruder proof with surveillance cameras installed at all locations with suitable monitoring. Present sports infrastructural facilities of the Institute are inadequate to accommodate increased students strength. It is proposed to develop Cricket pitches (4 nos. ), Volley ball courts (4 nos. ), Basket ball (2 nos. ), Tennis court (4 nos.) and Squash court (2 nos.). New Men (Aravali) & Women (Ganga) Hostels are constructed in the campus. The men hostel is of eight storied whereas women hostel is having five stories. In both the hostels, provision of lifts is mandatory. Creating a "home away from home" which will be often much more beautiful and impressive than it is by renovating existing rooms and adding many more rooms on existing VIP guest house. It is proposed to construct eighty new multi-storied flats in the institute to cater the needs of accommodation looking into the large number of faculty and staff appointments in near future.